Subaru is known for an entire lineup of vehicles that come standard with all-wheel-drive. But consumers can still buy a 2WD 2018 Subaru Impreza in the home country. Subaru is celebrating their 60th anniversary in Japan with a special Impreza Sport. 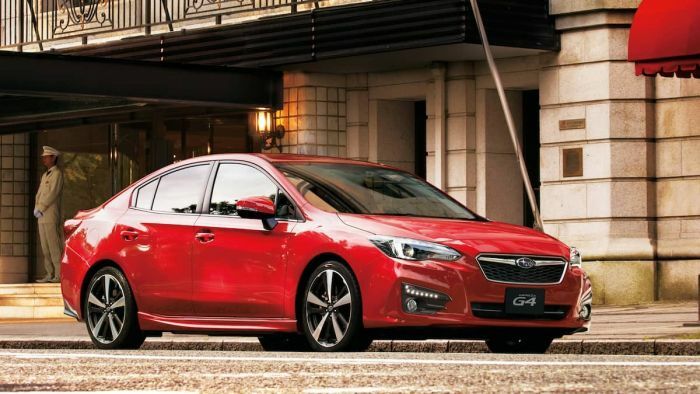 It’s surprising Subaru still produces a two-wheel-drive Subaru Impreza when it's their popular all-wheel-drive system that sets the brand apart from all other automakers. Subaru offers the 2018 Impreza Sport G4 in either 2WD (front-wheel-drive) or AWD for consumers in Japan. It still rides on the same new Subaru Global Platform, but the Japan-spec Impreza can be had with front-drive or all-wheel-drive configuration. In Japan, it also comes with a smaller 1.6-liter 4-cylinder Boxer engine coupled with the Lineartronic CVT transmission. It’s different in the U.S. where the only model without all-wheel-drive is the rear-drive BRZ sports coupe. In 1996 in the U.S., Subaru’s parent company Fuji Heavy Industries decided to make its All-Wheel-Drive system standard equipment on all their Subaru vehicles. It was a move that proved to be brilliant for the small Japanese automaker. At the time, it was a risky move when all other small Japanese cars were fuel-efficient front-drive cars. AWD became Subaru’s calling card and it became a core value for the small Japanese automaker. Subaru Corp developed their AWD system that would help its rally success of the 90’s called Symmetrical All-Wheel Drive. The system splits the torque nearly perfectly between the front and rear axles, helping it corner and handle like a rear wheel drive car. The Impreza line is perhaps Subaru’s greatest achievement in their 60-year history. Because the Impreza was an extremely versatile “economy” car, it allowed them to compete with companies like Toyota and Honda with their Corolla and Civic respectively. Today in the U.S., their Outback, Forester, Crosstrek, Impreza, WRX/STI and Legacy only come with all-wheel-drive. It’s surprising in 2018, Subaru still offers Impreza with a 2WD variant. Subaru still makes a front-drive version of their popular 2018 Impreza Sport for their home country customers. It is cheaper than the AWD version, so we assume it’s a good seller.